Christmas season is here and you’re getting ready to send friends and family your annual Christmas cards. You’ve already taken gorgeous family photos and picked out a theme. All that’s left now is picking your Christmas card wording, signing and addressing, and sending them out. To ensure you’re making the most of your Christmas notes, we’ve provided a helpful guide for Christmas card etiquette. The tradition of Christmas cards began in 1843 and since then became an important part of the Holidays for many families across the world. 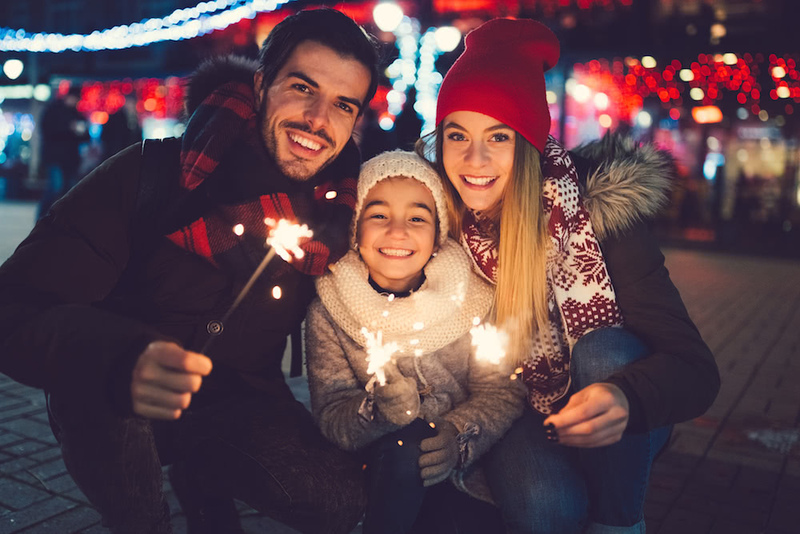 Christmas cards allow family and friends to reconnect, and for that reason, it’s vital that the cards include all the essential information. Christmas cards should be sent at least three weeks before Christmas, but no more than five weeks before. This gives the recipient plenty of time to hang up or display their Christmas cards for the holidays. 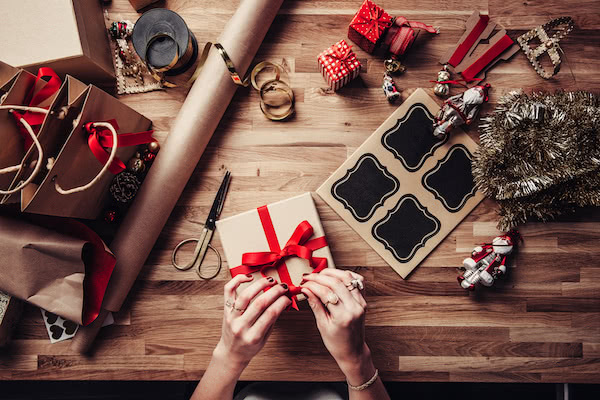 Make sure you give yourself time to collect family and friends’ addresses, to create and order your cards, to address envelopes, and to mail them out. A Christmas card message usually contains a holiday greeting, a personal message, a Christmas quote or saying, a sign off, and your signature, in that order. These messages should be personal, yet appropriate. You also want to make sure your message is right for the relationship of the recipient. If you’re struggling with coming up with messages, introductions, or sentiments for your Christmas cards, don’t worry. We’ve already compiled a list of Christmas card messages that you can read at any time. For close family and friends, it’s perfectly fine to address them in your letter with their first name or the name you know them best by. For less close friends, business relationships, acquaintances or the similar, use a little more care. Titles, such as Ms., Mr., Mrs., Dr., or other, may be more appropriate to use in these letters, depending on the relationship. If you know how the recipient prefers to be addressed, use that for your letter. If you’re unsure, err on the side of polite. Signing Christmas cards is the perfect way to add a final bit of personalization and holiday spirit. That’s why we’ve included some tips to make sure that yours look and sound as great as you imagined them. The most important Christmas card etiquette to adhere to when signing your name, is that it’s hand done. Use blue or black ink, not pencil or a less professional writing material. The card sign off should also include a closing sentiment. These sentiments can be more or less personal, depending on the recipient, or they can be Christmas themed. If you’re planning on signing your Christmas card from the whole family, pay attention to how you order the names. Traditionally, the husband’s name is first, followed by the wife’s. After that, each child’s name is added in the order of their birth. You can also simply write the plural version of your family’s last name, depending on what works best for you. If you’re not sure whether or not to add an apostrophe to the pluralized last name, it depends on the ending letter of your last name. If your last name ends in an s, use an apostrophe. And, if it doesn’t, you can forgo the apostrophe. Placing a card in an envelope is such an unnoticed etiquette rule, most people forget it. 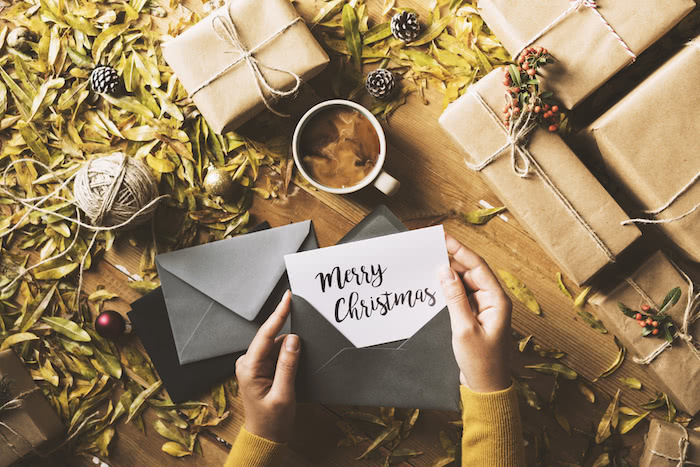 However, proper Christmas card etiquette calls for cards to be placed in an envelope so that the writing is facing the recipient when they open it. The writing should also be facing down so that the recipient doesn’t have to turn it all the way around. Once your Christmas cards are written, signed, and in the envelope, it’s time to start addressing. We’ve compiled a few tips and tricks to make sure everything goes smoothly in the final stretch. The recipient’s address should be neatly centered in the middle of the envelope. If you’re handwriting the addresses, note that the following need to be included, all on separate lines. Try to keep your handwriting as neat and legible as possible. You don’t want to risk the mail carrier delivering the letter to the wrong address, or even having it sent back to you. Also, make sure to write the address in pen, not pencil or marker. Proper addresses and correct recipient names are essential when sending Christmas cards. Note that proper addresses (Ms., Mr., Mrs., Dr., or other) should be included when writing the recipient’s full name on the envelope. If you are unsure of what title is appropriate for the person receiving the letter, it’s safest to use either Mr. or Ms., though the best solution is to do a little research. If you are addressing the envelope to an entire family, don’t write out each of the family member’s names on the front of the envelope. Instead, write “The (Pluralized Last Name).” Don’t forget, if the last name ends with a “s” naturally, add an apostrophe. If the Christmas card is for a married couple without children, you should write more than just the pluralized form of their last name. Traditionally, you would address these envelopes as “Mr. & Mrs. (Last Name).” If one of the two kept their original last name, you should address it differently. Instead, write “Mr. (Last Name) & Mrs. (Last Name).” The same rule applies to hyphenated last names. We highly recommend ordering personalized return addresses to make this step simple and create a more elegant card. If you decide to write the return address by hand, only use pen, and write the address in the upper left hand corner, opposite from the postage stamp. The following should be included in the return address, all on separate lines, before you drop the cards in the mail. If you’re looking for additional resources for Christmas cards in the holiday season, look no further. We’ve also written guides on Christmas card messages and wishes and what to write in a Christmas card. Or, you can browse our Christmas stationary for some inspiration for this year’s Christmas cards.